I have to admit, this Creamy Lemon Garlic Hemp Sauce was a beautiful accident one day while experimenting in the kitchen. An accident that I now make weekly, eat daily and work into a variety of dishes including salads, noodles, and veggie-grain bowls. It's a great sauce to have handy to add to meals, and can also be used as a dip for snacking! Hemp seeds, once blended, add a creamy, smooth texture to things like smoothies, dressings and sauces. Which is just one of the reasons this superfood is so well loved by vegans and health nuts. So although "buttery" in texture, this sauce is packed full of antioxidants, vitamins, essential fatty acids and really couldn't be any better for you. So go ahead, make up a batch of this sauce and indulge with pleasure and without guilt. CREAMY LEMON GARLIC HEMP SAUCE: a healthy, detoxifying, versatile sauce. Place all ingredients in blender and blend until thick and smooth. Store in a jar or glass container in the fridge. LEMON: a natural detoxifier, rich source of vitamin C, and contains limonene that promotes immunity and helps fight infection. GINGER: anti-inflammatory, contains antioxidants, and clears microcirculatory channels of the body which include the sinuses and throat. Also, ginger is a warming agent and promotes sweating, which is healthy when sick. RAW HONEY: contains antioxidants, and a rich source of minerals and B vitamins that help support the function of the heart, muscles and nervous system. OLIVE OIL: anti-inflammatory, contains antioxidants, lowers cholesterol and promotes heart health, rich source of vitamin E which is good for the skins and has an anti-aging effect. HEMP SEEDS: anti-inflammatory, contains antioxidants, packed with omega 3 and 6 fatty acids, rich source of vitamin B complex and vitamin E and high in minerals, promotes heart health and circulation, high in fibre, and contains tryptophan which helps regulate sleep and improve mood. I will be sharing a variety of recipes that include this sauce, so make sure to tune back in for those soon! Pesto is far more versatile than given credit for- my recent appreciation for this Italian staple has opened my eyes to the many possibilities of form and flavour it can take on. I'm certain the list of ingredients that I've been experimenting with would have your Italian grandmother rolling over in her grave. A classic Italian Pesto consists of basil, garlic, pine nuts, olive oil and parmesan. However, I was sure we could squeeze more nutrients and vitamins in there, after all, it's green! After dabbling with basil substitutes such as swiss chard, kale, and spinach, playing with cheese versus no cheese, and replacing pine nuts with every nut under the tree, I stumbled across a recipe that achieves both nutritional value and great taste. 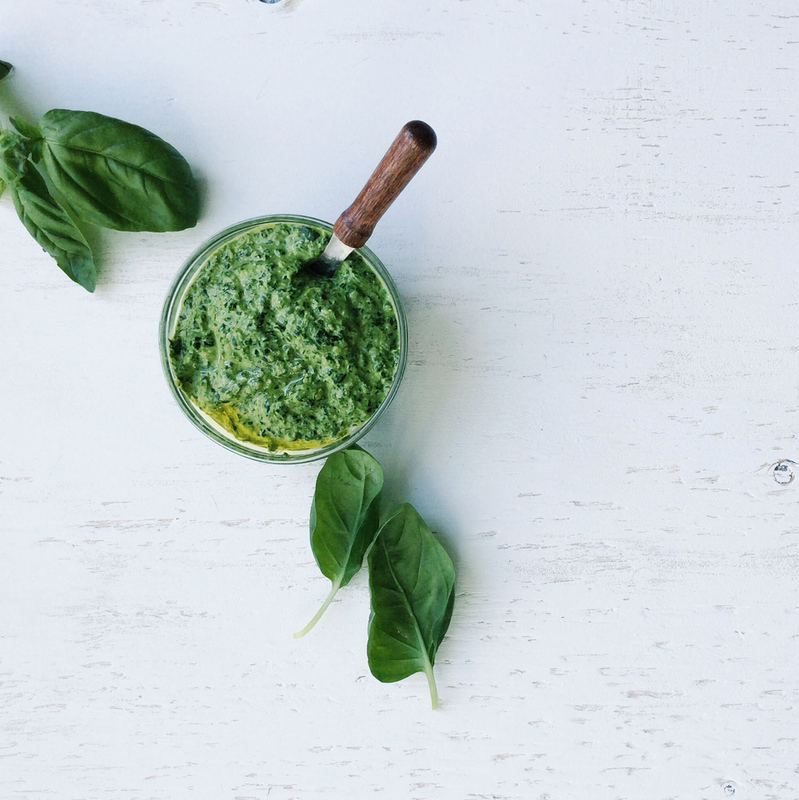 Nutrition Stripped Spinach Basil Pesto recipe includes the key ingredient to any great pesto: basil. Without basil, however which way you make it, its flavour will simply be lacklustre. Three other reasons why I think this recipe is awesome: walnuts, hemp seeds and nutritional yeast. These include an amazing combination of essential fatty acids, omega 3, vitamin B-12, amino acids and protein. A food processor, Vitamix, or Jamie Oliver's pestle and mortar technique can be used to prepare this recipe. So, go whip up your batch! You'll have enough for my Zucchini & Soba Noodles with Walnut Spinach Pesto (recipe to be posted later this week), and some left over for other creative inspirations such as pesto toast with poached eggs, pesto portobello parmesan pizza, lemon pesto hummus, and tomato pesto grilled cheese.